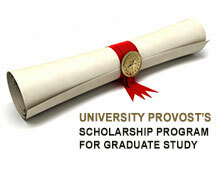 Students who are admitted to a master’s program at the University beginning with the Spring 2013 semester and who plan to register for at least 6 credits may apply for a University Provost's Scholarship for Graduate Study. Students must have an undergraduate CGPA of at least 3.0 (on a 4.0 scale) and standardized test scores (GRE, GMAT or other) that are acceptable for admission to the master's program of their choice. Students who are admitted to a master’s program with a nonstandard tuition rate, as well as students who are enrolled in graduate study as part of a combined (bachelor's/master's) degree program, are not eligible for a University Provost's Scholarship. In addition, students who are awarded another scholarship for graduate study at the University (e.g., an alumni grad grant, a graduate assistantship, or an international student scholarship) are not eligible for a University Provost's Scholarship. Note: Only students who are enrolled in one of the master’s programs noted above at either the Florham Campus or Metropolitan Campus may apply for a University Provost’s Scholarship. Students who are enrolled in an off-campus or online master’s program (even if they are permitted to take courses on campus) are not eligible for a University Provost’s Scholarship. An algorithm for each master’s program has been established to determine eligibility for each award level. Students with an undergraduate CGPA of at least 3.0 (out of 4.0) and standardized test scores that exceed the 67th percentile are strongly encouraged to apply. In some instances, a higher CGPA can offset lower standardized test scores (and vice versa), so students with scores that are close to the preferred cutoffs are also encouraged to apply. Students must register for at least 6 credits each term (unless it’s their last term and they need fewer than 6 credits to complete their program) and must maintain a CGPA of at least 3.33 (on a 4.0 scale). To apply for a University Provost’s Scholarship for Graduate Study, please complete the application form at the link provided below, and then click the submit button at the bottom of the application form.